Wellington, FL (October 24, 2014) — Devon Kane and her self-trained Grand Prix gelding Destiny have made their presence known upon returning to Wellington, Florida, after a summer of unexpected events and learning experiences in Europe. At the 2014 Great American Insurance Group USDF Region 3 Championships and Wellington Classic Dressage Autumn Challenge on October 16-19, 2014, Kane and Destiny proved to be unbeatable in the Grand Prix. 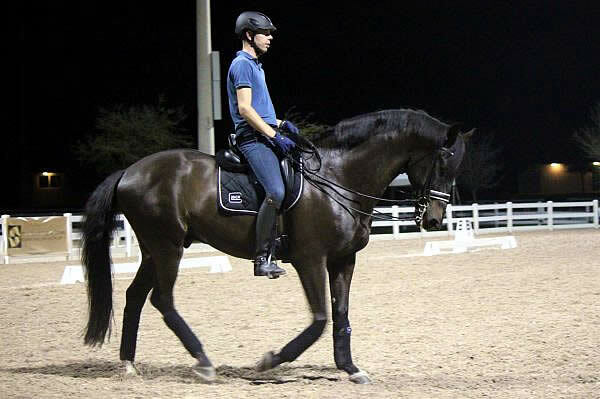 Kane recently returned from a summer of training with Olympic Gold Medalist Hubertus Schmidt in Germany in preparation for the winter dressage season in Florida. Kane and Destiny entered the Global Dressage Stadium at Palm Beach International Equestrian Center this past weekend looking better than ever. Kane and the Danish Warmblood won the Grand Prix on Friday with a 72.450%, and went on to sweep the Grand Prix Regional Championship with a commanding lead on Sunday. They are now qualified to compete at the 2014 US Dressage Finals in Kentucky. Kane and Destiny are based at Diamante Farms in Wellington, Florida, where Kane is the head trainer. For more information about Devon Kane, Destiny, and the top-quality training, clinics, boarding, and sales that Diamante Farms offers, visit www.DiamanteFarms.com or call 210-240-1614. Wellington, FL (October 22, 2014) — At the Wellington Classic Dressage Autumn Challenge held in conjunction with the 2014 Great American Insurance Group USDF Region 3 Championships on October 16-19, 2014, beautiful horses and skilled riders filled the Global Dressage Stadium at the Palm Beach International Equestrian Center in Wellington, Florida. As the competitors executed piaffes and passages in front of the judges, the Neue Schule Bits distributor Metlar Premium Performance Saddlery was intently focused on the riders’ hands. Metlar Premium Performance Saddlery, the North American distributor of Neue Schule bits, knows that even the best bits are only effective when riders use their hands correctly. Metlar awarded the Neue Schule Best Hands Award to the rider with the softest and most sensitive hands at the show to applaud this skill. 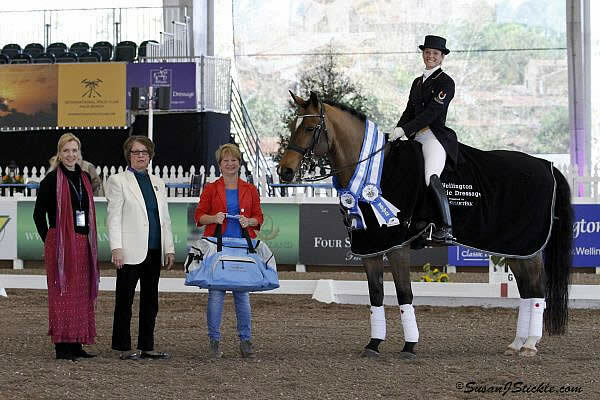 Metlar Premium Performance Saddlery was happy to award Brinkman with the Neue Schule Best Hands award, and is glad to see that Brinkman is passing on the importance of having good hands to her students. For more information about Metlar, Neue Schule, and the ergonomically designed bits that Neue Schule offers, visit www.NeueSchuleBitsUS.com or call 631-252-5574. On behalf of Wellington Classic Dressage (WCD), we are responding to the recent article posted by Ken Braddick on Dressage-News.com regarding a potential date conflict for the Friday date only of the upcoming Back to White Fences show in March 2014. This potential date conflict was part of an on-going process with USEF between Wellington Classic Dressage (WCD) and Equestrian Show Holdings (ESH), which started back in 2013. WCD did not suddenly “file a complaint” against Adam Pollack or his White Fences Show Licensee, and this was NOT an intent to sabotage the season so close to the actual show dates as was incorrectly reported in this article. It was simply a dispute regarding 1 show day in an entire show season. It is unfortunate that this appears to be a pattern of reporting that does not represent an accurate and unbiased account of the facts. Instead, it reports only the opinions of the author and of Adam Pollack, and is not based on any official comment from USEF, WCD or ESH. There are numerous inaccuracies in the article related to the intent and manner of the date conflict. First and foremost, Wellington Classic Dressage was and remains the Priority Date Holder for the Thursday and Friday show days for this respective competition week. WCD hosted USEF licensed and FEI recognized competitions on this date since its inception, primarily at the Equestrian Estates venue as part of the IHS Show season, although WCD remained the licensee. As part of a joint meeting with USEF and the Florida CDI organizers back in May of 2013, we were asked to work together to reduce the Florida CDI and national calendar. Throughout the summer of 2013, WCD and ESH had numerous communications with USEF regarding the 2014 season date calendar for Florida, and as part of a joint agreement for 2014, WCD and ESH signed joint permission letters to allow ESH to run a competition on the March 20-21, 2014 date. It is unclear how, but without the permission of WCD, Adam Pollack’s White Fences show was allowed to run on our 2013 Friday date. When WCD and ESH submitted our joint permission letter to USEF for the 2014 season date, USEF advised us of a potential date conflict for the Friday date with the White Fences show. Subsequently WCD requested USEF look into the matter and to resolve the date conflict. It was our intent to work this out amicably and in a manner that was fair to all parties involved. For the record, both ESH and WCD have declined to host the show on Friday March 21, 2014, so Adam Pollak will be allowed to host his White Fences show on this date for 2014. Wellington Classic has supported the sport in the community for many years and we look forward to doing so in the future. 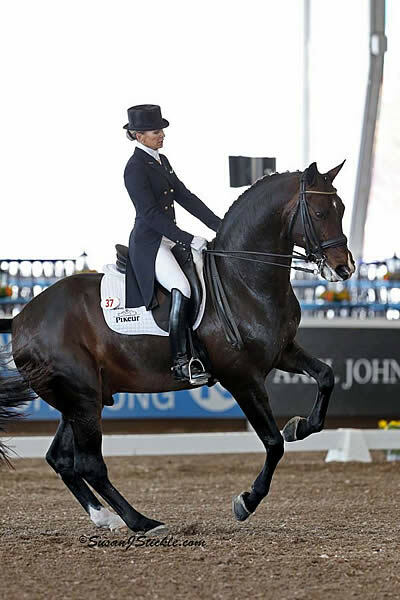 Wellington, FL – January 26, 2013 – Canada’s Mathilde Blais Tetreault and Michelangelo scored a 69.781% to win Saturday’s FEI Young Rider Individual Test YR NAJRC Sponsored by Diamante Farms. The pair also won Friday’s CFEI Young Rider Team Test (PSG) YR NAJYRC GAIG/USD with a 67.061%. Rebecca S. Cohen earned second place on Downtown, her own Westphalian chestnut gelding, in today’s class with a 65.088% and third place in Friday’s class with a 62.325%. “Yesterday was OK but today was a lot better,” she said. “It was really solid today. We didn’t make any mistakes. 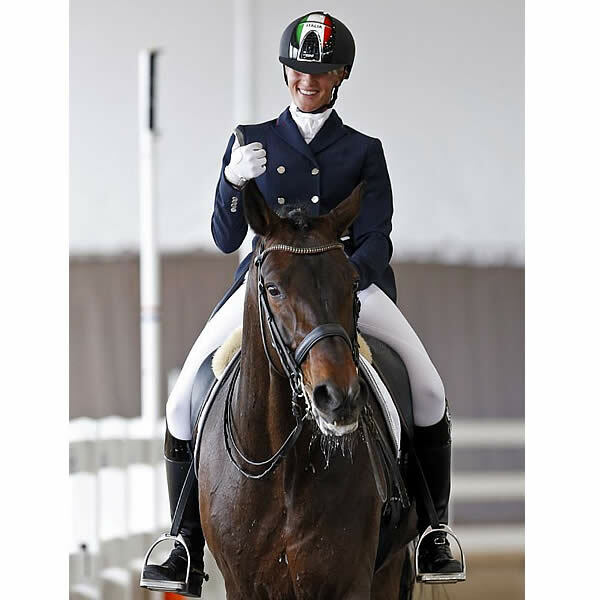 Wellington, FL – January 24, 2013 – Lisa Wilcox and Pikko Del Cerro HU scored double wins at the Wellington Classic Dressage Sunshine Challenge CDI3* with victories Friday in the Grand Prix Special and Thursday in the Grand Prix. Pikko Del Cerro HU, a 16.2 dark bay Hanoverian stallion owned by Horses Unlimited and Anne Sparks, scored 68.854% in Friday’s FEI Grand Prix Special CDI3* USEF HP $1,000 sponsored by Palm Beach Equine and Sports Complex. The pair won Thursday’s Grand Prix CDI3* with 69.574%. In both tests, Pikko Del Cerro showed off his expressive, high piaffe and smooth tempis. 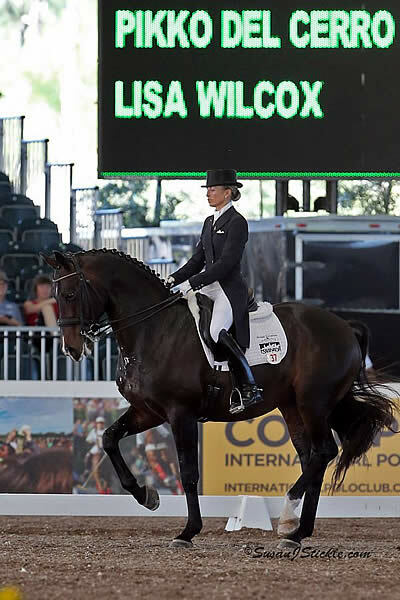 Wellington, FL – January 24, 2013 – Lisa Wilcox and Pikko Del Cerro HU’s effortless test impressed judges and earned them the win at today’s Wellington Classic Dressage Sunshine Challenge Grand Prix CDI3*. Pikko Del Cerro HU’s showy gaits and big extended canter were rewarded with a score of 69.574%. This was the pair’s first international competition, and Wilcox said she was “very, very pleased” with the results. 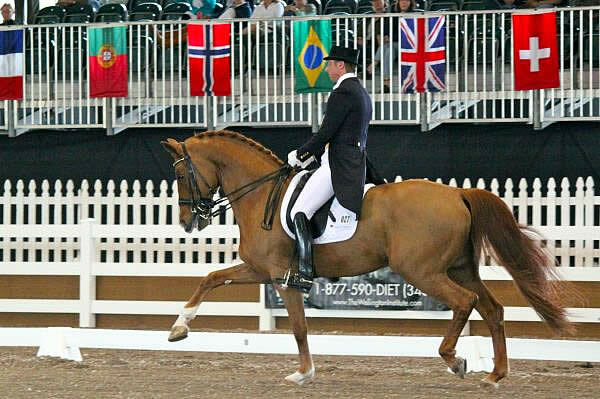 Wellington, FL – January 21, 2013 – As World Dressage Masters (WDM) CDI5* Palm Beach approaches, the top names in international dressage are gathering. On Saturday evening, Jim Brandon Equestrian Center welcomed two horses that will certainly catch the eye of spectators at the Jan. 24-26 competition. Withney van ‘t Genthof, who will be ridden by Hans Peter Minderhoud, and Inter Floor Next One, Edward Gal’s mount, stepped off the trailer around 6 p.m. A veterinarian representing the Animal and Plant Health Inspection Service was present to supervise the horses’ unloading from the sealed trailer. Wellington, FL – January 19, 2013 – Patrik Kittel and Watermill Scandic added a brilliant victory in today’s Gold Coast Opener Grand Prix Freestyle CDI-W to their win in Friday’s Grand Prix CDI-W, both at Jim Brandon Equestrian Center. The pair of strong showings establishes them as top contenders in the World Dressage Masters (WDM) CDI5* Palm Beach at Jim Brandon, which will take place January 24-26. WDM will be far from a walkover, however. Kittel and Watermill Scandic will go up against many of the top-placed pairs from today’s competition, as well as an array of new challengers that includes Steffen Peters, Edward Gal, and Hans Peter Minderhoud. But Kittel and Scandic impressed both the judges and the crowd with their stirring freestyle routine. They performed to an assortment of upbeat rock tunes, displaying impeccable passage transitions to “Hot in the City.” “I think it’s one of the best feelings I’ve ever had in the piaffe/passage,” Kittel exclaimed. Although “Dancing with Myself” was also among the musical selections, Kittel and Scandic danced together in complete harmony through rhythmic one-tempis and a striking canter half-pass. The judges awarded them a score of 80.125%.